What is plasma? This glowing, ethereal condition is often known as the forth state of matter. More specifically, Plasma is the gaseous state of matter where gas has been energized to the point that some of its electrons have broken free from–but still travel with–the nucleus of the molecule. Things glow when the molecules calm down, and give up some of its energy in the form of light. The plasma lamp was invented by our hero, Nikola Tesla. His research into high-frequency and high-voltage phenomena led him to create what he called the Inert Gas Discharge Tube. Most of us know it today as the fluorescent tube. The construction is fairly straight-forward: a glass enclosure containing an electrode is pressurized with gas, and the interaction between the free electrons from the electrode and the gas inside the enclosure creates plasma. 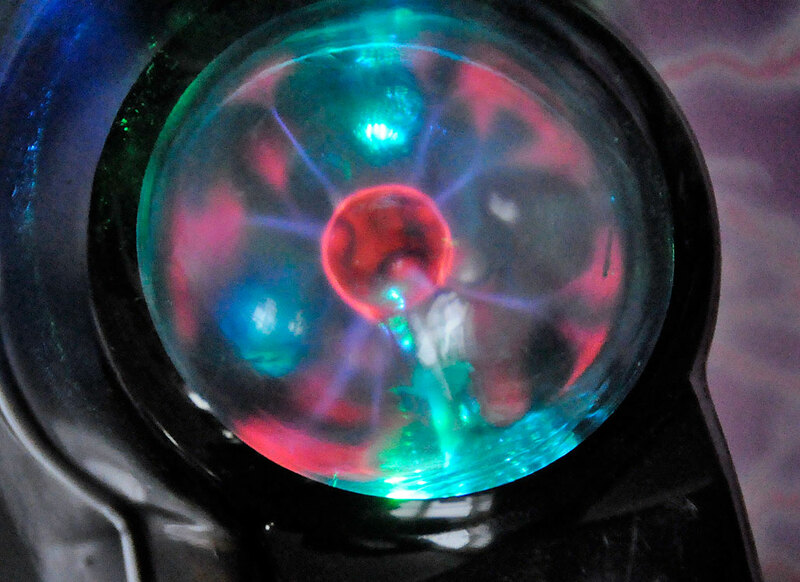 In the 1980s, there was a brief craze where plasma globes were being sold at places such as the Sharper Image and other “high tech” gadget stores. MIT had a large exhibit of the colorful plasma creations many years ago. The globes ranged in size from 8″ in diameter to a few feet, and glowed in a variety of colors. There are still a few of them on permanent display at the MIT museum. The fad died out when folks realized you couldn’t do much with the globes and the “coolness” factor was temporary. Most have gotten rid of theirs at garage sales and such, but we held onto ours in hopes of a resurgence like that of the lava lamp. We, like the rest of the world, had pretty much forgotten about them until we came across a tiny (1.5″) version of these plasma novelties from Pilot Automotive. 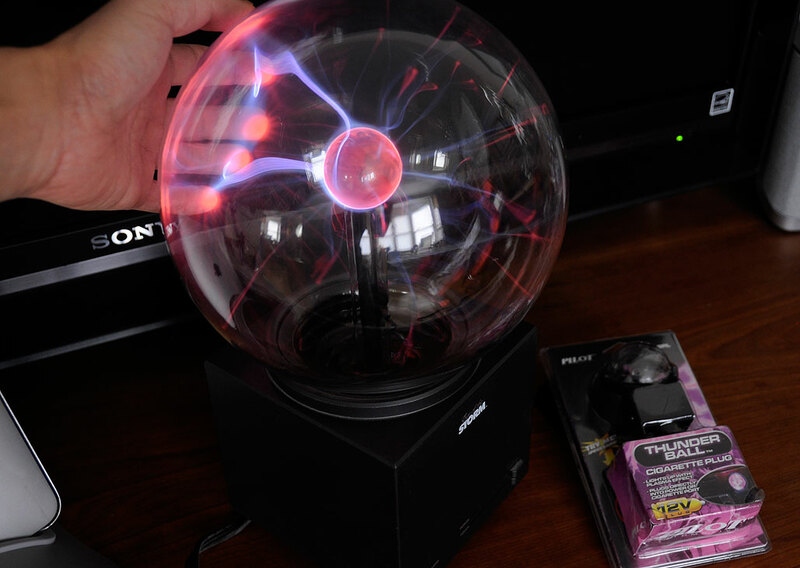 The Pilot Automotive ThunderBall is a 12V version of the plasma globe. The difference is that the ThunderBall is not just the size, but its ability to change color (blue, red, green, aqua). We are not quite sure how it does that yet, but it is an interesting effect. The kit came with two 6V-block of batteries arranged in series to provide the 12V. The battery pack is attached to a button trigger and a socket. The stem part of the ThunderBall is in the form of a plug which will fit into a car’s lighter socket. This way, the ThunderBall may be powered by batteries or draw power directly from the car.